1. Place each chicken piece between 2 pieces of plastic wrap. Pound lightly with the flat side of a meat mallet to 1/4-inch thickness. Remove plastic wrap. Combine flour, salt, and ground red pepper. Coat chicken pieces with flour mixture. 2. In a large skillet heat olive oil and butter or margarine over medium heat. Add chicken and cook for 6 to 8 minutes or until chicken is tender and no longer pink, turning once. Remove skillet from heat. Transfer chicken to a serving platter; cover and keep warm. Add nectarines, brandy, water, and lemon juice to the skillet. Return to heat and cook for 1 minute, stirring gently. 3. 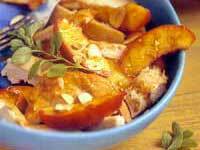 Serve the fruit mixture over chicken. Sprinkle with almonds. Garnish with oregano, if desired.